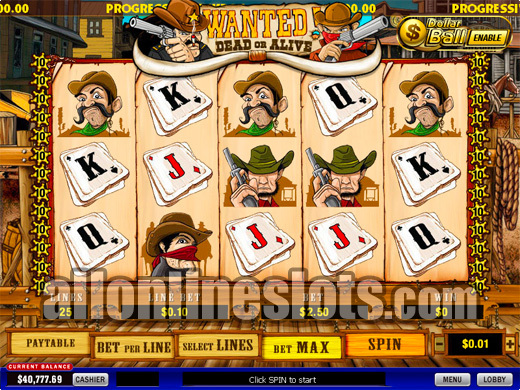 Wanted is a Playtech 25 line slot with a wild west theme. It has a top line win of 10,000 coins for five of the Dynamite symbols. 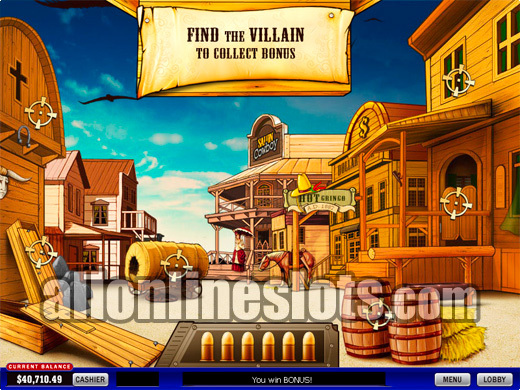 Get a Gun on the first and last reels and you win a shot a tthe two stage second screen game. 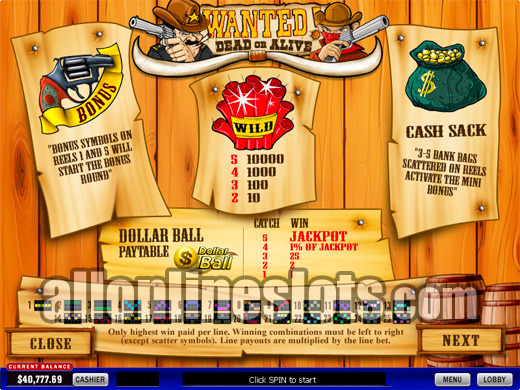 Wanted is a 5 reel, 25 line video slot with a pick a box style bonus feature. It is found at all Playtech powered online casinos and is also linked to the Dollar Ball Jackpot. You have the option of betting an extra $1 per spin to have a chance at winning the progressive prize. Maximum bet is 10 coins per line so you are looking at 250 coins per spin if you are going to hit the max bet button. The good news is that Wanted comes in so many coin sizes that you are sure to find a bet level that suits your bankroll. The maximum bet range is $2.50 to $1250. On the reels there is a wild symbol (The Dynamite), two bonus symbols (The Gun and The Money Bag), three characters and five card symbols. The top paying symbol is the wild which awards up to 100000 coins when five line up at max bet. The three characters make up the nest three highest line wins. The Gun symbol appears only on the 1st and 5th reel. Getting both symbols on the screen at the same time awards the bonus stage. 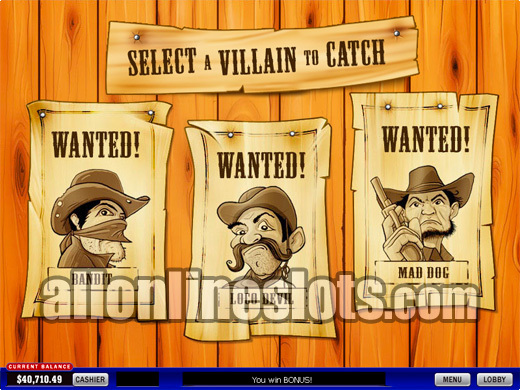 The bonus starts with you having to pick one of three Villains (Screenshot). Once you have made your selection you move on to the hunting stage. The way the bonus stage pays are calculated is quite simple. Your triggering bet is multiplied by between 2 and seven depending on how many bullets you use to find the villain. This means the higher you bet on the reels the bigger the potential jackpots on the bonus stage. Wanted also has a reel based bonus. The money bags are scattered and getting three or more activates the bonus. You then get to pick one to reveal your bonus win. Again the wins are multiples of your line bet. Once you have picked your money bag your prize is awarded and you get to see what the others paid. This can be a little annoying especially if you picked badly. 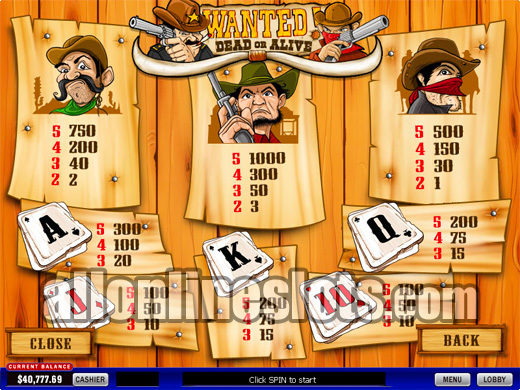 In the end Wanted is a top quality video slot from Playtech. It is worth noting that if you are in the USA you cannot play at Playtech casinos. If you are not in the US then it is a game well worth checking out.